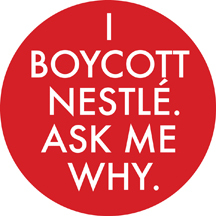 You can find images, banners advertisements and widgets from Baby Milk Action for promoting the Nestlé boycott in our Nestlé-Free Zone and in our online Virtual Shop (where there are other resources for promoting the boycott). Feel free to send us your own images and resources or add them to these page as comments (you will need to register with the site to do so). Thanks to those who provided the following for International Nestlé-Free Week (which includes Halloween). 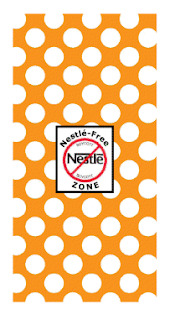 From the Boo Nestlé site, which says: "We are grateful to Lisa Komer of Munchkin Designs who created these Nestle-free Zone candy wrappers for us. Simply print out this page on regular or sticky-backed paper, cut them out and tape onto any candy or snack bar. They are perfectly sized for the mini-sized bars that many brand offer but will also work on most trick-or-treat items. We suggest you put these over the regular wrapper so parents (and kids) know what's inside. (Also, it should go without saying but just in case... don't put them on Nestle-brand products because it kind of defeats the purpose.)" 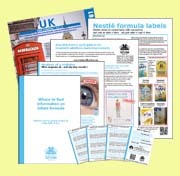 Visit Boo Nestlé to download. Download this image donated by Robyn Bowman to make a badge. 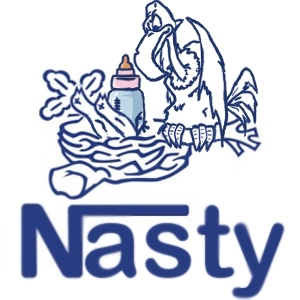 This Nestlé vulture logo is available to download for printing as stickers - click here. This alternative version has been provided by Kitty Simmons - click here.